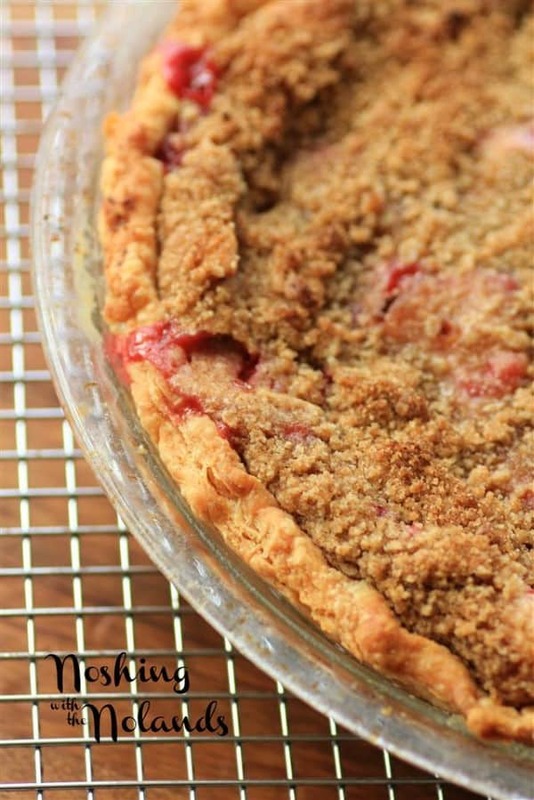 Do you have rhubarb in the yard or freezer? Well, get it in the kitchen to make these Super Easy Rhubarb Tarts!! I adore the flavor of rhubarb in many recipes. 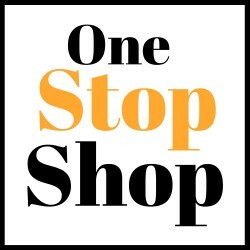 It is unique and some what of a treat because it is not readily available all year round. 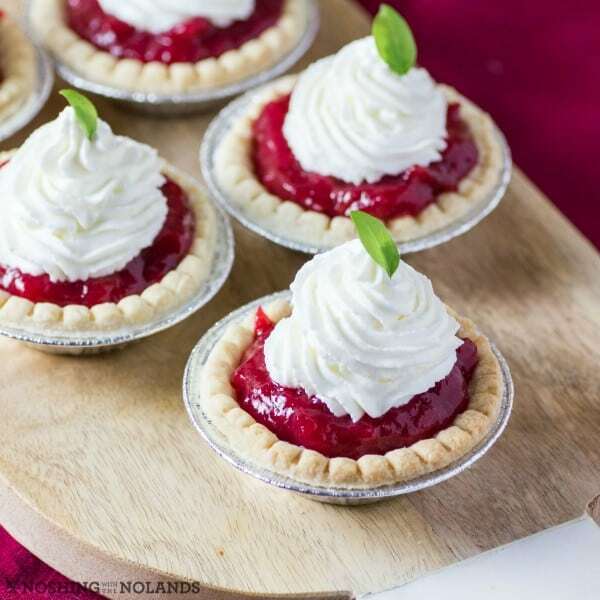 These tarts along with a couple of other recipes that I will show you, will have you enjoying rhubarb for as long as you can! I am blessed to have a ruby red vaietal of rhubarb that makes the prettiest of desserts!! The stalks aren’t as tall or wide as some kinds of rhubarb but they are deep crimson in colour, hence making your desserts gorgeously coloured. These tarts take very few ingredients to make. Plus everything can be made ahead and then they are assembled and served. I liked doing it this way to keep everything fresh! Super Easy Rhubarb Tarts take only a few ingredients and are pulled together in no time. A great recipe to celebrate rhubarb that your family and friends will love. For the filling add the rhubarb, cornstarch and sugar to a small saucepan. Cook stirring occasionally until the rhubarb breaks down, about 5 min. Set aside to cool and then refrigerate. When ready to serve, fill each tart with about a heaping tsp. of rhubarb, dividing among the 12 tarts. 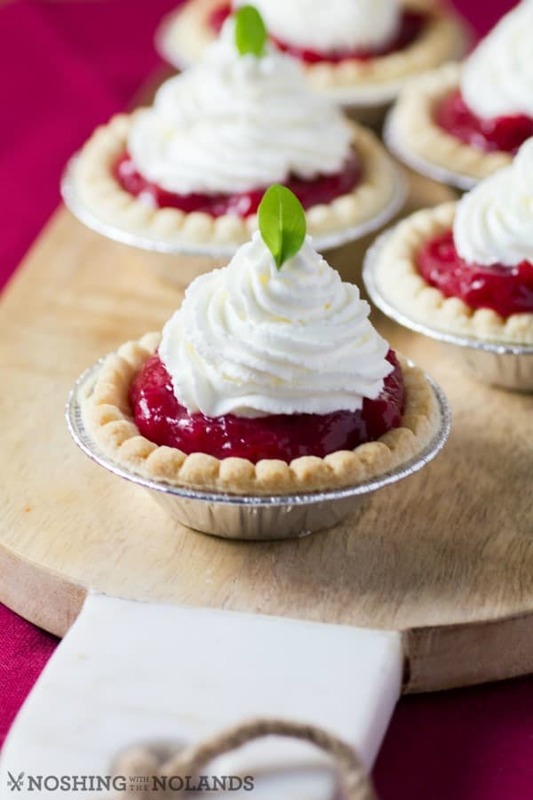 Top with whipped cream and a small basil or mint leaf. 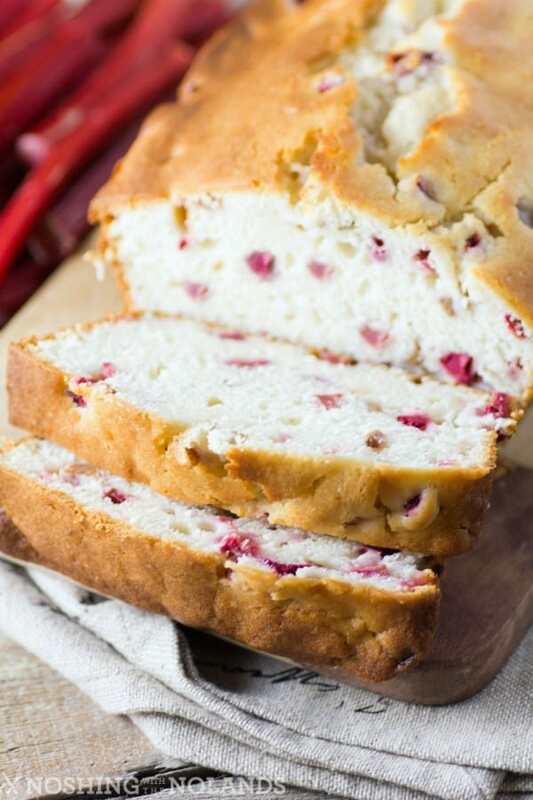 I recently also made this amazingly moist and delicious Old Fashioned Rhubarb Loaf. The loaf is nice and moist from the inclusion of sour cream. In addition it will take you from breakfast to dessert!! Our Rhubarb Strawberry Sour Cream Pie has been a hit in this household for years. It is luscious and creamy with a crunchy topping. The sour cream adds so much to this pie, as a result making it a real show stopper. 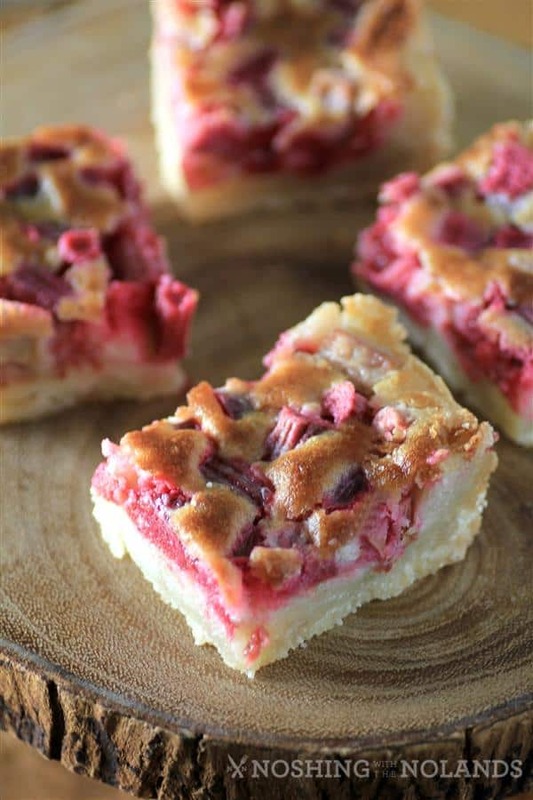 Our most popular recipe though by far has been these Rhubarb Dream Bars. These bars are very easy to make also and they are pretty in pink for a scrumptious summer treat! The tarts look so good and I like how easy they are to make. I don’t think I have ever had Rhubarb, but I would like to try it. Yum! All of these look delicious. I’ve made rhubarb jam before (mixed with strawberries to sweeten it), but these tarts and the bread look like something else I need to try! I love the tartness of rhubarb as well as the beautiful color! I don’t think I have ever had a rhubarb tart before. This recipe looks yummy though! I have never had rhubarb before! These tarts looks just heavenly. Yum! One of my favorite things about summer… Rhubarb! Love to try new things with it. All of those look amazing! I have to say that the loaf looks the best. I would love to try it out sometime. I bet it’s going to be so good! Rhubard is something that I have never tried before, but those tarts look really good! I will have to make it a priority to make these. I’m reading this and looking at those delicious looking tarts and realize I’ve never had rhubarb before. Hmmm, I may have to eat some soon. I love these tiny tarts. They looks so cute mini size 🙂 Perfect dessert as we head into back to school season! All of these desserts look amazing. I will have to start with the Rhubarb Strawberry Sour Cream Pie. Then the tarts. I love rhubarb. These recipes all look delicious. I will have to get the ingredients I need to make the tarts this weekend. I want that kind of rhubarb in my yard. I am a HUGE rhubarb lover, and all of your desserts here look glorious! 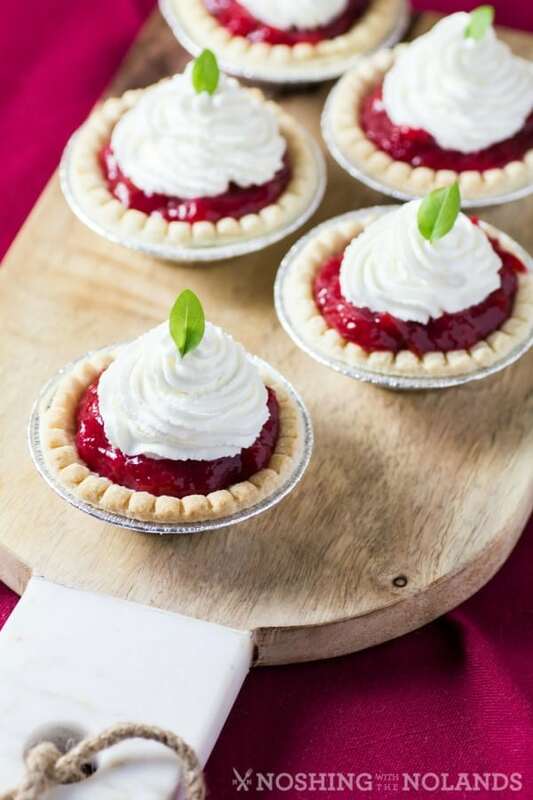 I love how cute these mini rhubarb tarts are! The mint leaf on top was a great touch too. I have a ton of Rhubarb I need to use up. I will have to try the tart recipe tomorrow. The kids are going to love them. I would just freeze the filling not the whole tart and make them fresh.